Faraway Press: The Online Home of John Jackson Miller: Knight Errant Deluge #2 and Mass Effect Evolution collection now on sale! 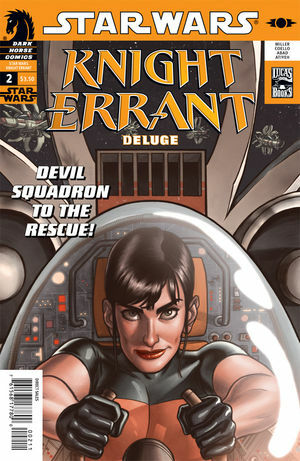 Knight Errant Deluge #2 and Mass Effect Evolution collection now on sale! Another double-on-sale day: The collected edition of Mass Effect: Evolution is now on sale, as is the second issue of Star Wars: Knight Errant — Deluge! Evolution is available in two editions in the United States, but only one of them, the trade paperback, is in wide release. There is also a hardcover edition produced in limited numbers for the Science Fiction Book Club and other vendors. But all editions also include a preview of Mass Effect: Invasion, as well as "Incursion" and "Inquisition," two stories by Mac Walters that were previously web-only. Pages have been set up on the site here for all the latest issues coming out, including for this fall's Mass Effect Invasion; two spiffy covers for each issue. Notes coming here later for that issue; in the meantime, pages are online here for the Evolution trade and, at last, for the Aflame collection.